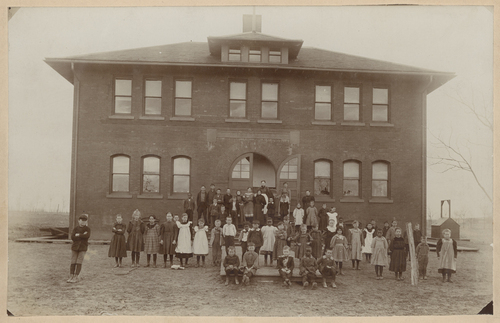 A group of students and teachers standing outside the Old Gage School. The school located at Eighth and Orleans was built in 1898 with two floors and a basement. The second floor had partitions dividing the rooms between grades. The building had electricity and running water but the restrooms were outhouses. In 1929, the school was replaced with a new building at the corner of Eighth and Prospect latter know as Oakley.